"Provides 24 hour supervision providing immediate assistance any day or any time"
» Is licensed, bonded, has a $3,000,000 general liability and a $1,000,000 workers compensation policy. » Officers are fully licensed, meet the standards set by the state of California, and have their licenses verified by the California Bureau of Security and Invesitgative Service. » Clients have access to our management team 24 hours a day 7 days a week. » Provides 24 hour supervision providing immediate assistance any day or any time. » Offers services on “trial Basis”, meaning the client does not have to sign a long term contract. » Provides our officers with radios, cellular phones and bicycles at no additional cost to our clients. » Provides marked patrol vehicle, bicycles, and golf carts, when a large area needs to be covered. » Management and supervisors visit our customers sites unannounced for quality inspections. » Provided a computerized patrol monitoring system (Detex) . Our security personnel is monitored by printed reports given to our clients. » Officers are professional and fully trained in cpr, first aid , pepper spray, baton , fire arms and powers to arrest. » We have absolutely no overtime charges, with the exception of 6 major holidays. » Can provide any style or color uniform requested. » Security programs are customizable to meet our clients needs. » Provides signage to post around the perimeter of your property. 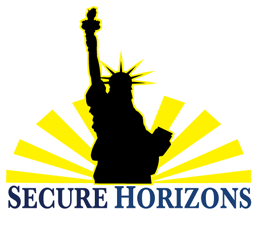 Secure Horizons Inc. is protected by a broad form commercial liability insurance policy covering property damage, bodily injury, errors and omissions care. Upon award of the contract and at your request, our insurance carrier will provide you with a certificate of insurance designating your business as “Additional Insured”. The insurance coverage can be increased to a satisfactory level to accommodate client’s needs.